I’ve just returned from Alaska. For those of you who might’ve noticed that my obsessively regular blog had gone eerily quiet and wondered, it had fully been my intention, as it usually is when I travel, to write posts from wherever I am about the interesting food-related experiences I am having there. But I was aboard a cruise ship, and with wi-fi connection at $.75 a minute, the blogging could wait. So now you get the benefit of my reflections upon my time in Alaska, versus the immediacy of receiving posts from the front. In other words, you get the edited version versus the rambling. And that’s better anyway, right? I went on my first cruise — to Alaska — some 12 or 13 years ago. Being a young person who was used to packing a carry-on, hopping on a plane and then hopping off to explore some exotic place or other, I was pretty sure I wasn’t a cruiser. But I was doing work for a cruise line, it was free, and I’d always wanted to see Alaska. Now, when people tell me they’re pretty sure they’re not cruisers, I tell them to get back to me after they’ve taken a cruise. That’s what I used to think, and now I’m a cruiser. I’ve learned, however, that there are a lot of different kind of cruisers. I, for example, am an unusual sort on the cruise ship — I like ports, and I like the ocean. So forgoing the endless bingo contests, enrichment lectures, art auctions, spa treatments and gym classes, I like to sit on my balcony and stare at the sea. I see many interesting things — wildlife such as sharks, whales and albatrosses; cargo vessels and other cruise ships; uninhabited islands; electrical storms and fascinating cloud patterns. Plus, the vast expanse of undulating ocean makes me feel small and insignificant, which I like. The first cruise line I worked with, Crystal Cruises, was sort of the Relais & Châteaux of the industry — the finest European-style service, exquisite linens, food onboard from the likes of Valentino and Nobu, sevruga caviar and French champagne handed to you at every opportunity. Cruisers on those ships were sophisticated, wealthy and — at a median age of 78 — quite old. My then-girlfriend and now-wife Leslie and I enjoyed hobnobbing with various heiresses or the guy who invented Levolor blinds, for example. And we were quite the curiosity, these cheerful young people. Now, among others, I work with Princess Cruises. And the cruisers are a little different. Princess is more like a nice Hyatt. You get a combination of guests — very refined, cultured people; families and gamblers; and party people. You also get a few people who seem like they’re more Motel 6 types — the sort missing complete grammatical constructs from their speech, who don’t realize the linguistic flourishes in their language may not be suitable for the children sitting nearby. While not Nobu Matsuhisa, the food on Princess is quite good. And there is a lot of it, which explains the other kind of cruiser you see quite of a few of — the very, very large cruiser. You notice them lumbering slowly, much like the glaciers we witnessed in Alaska, leaden with the weight not only of their waistlines but of the towering structures of bacon, sausage, jalapeño poppers, cold cuts, pastas, breads and desserts on their oversized buffet plates. To be fair, it is challenging, we have learned, to practice restraint in the face of unlimited quantities of good food. For example, if at breakfast I am faced with the choice between biscuits and gravy, corned beef hash and fried egg, or smoked salmon with all the trimmings, why not choose all three? My children and their surrogate older sister Maya, daughter of pals and godparents Ernie and Debra, thought they had died and gone to a much better place. This, my friends, was indeed kid heaven. 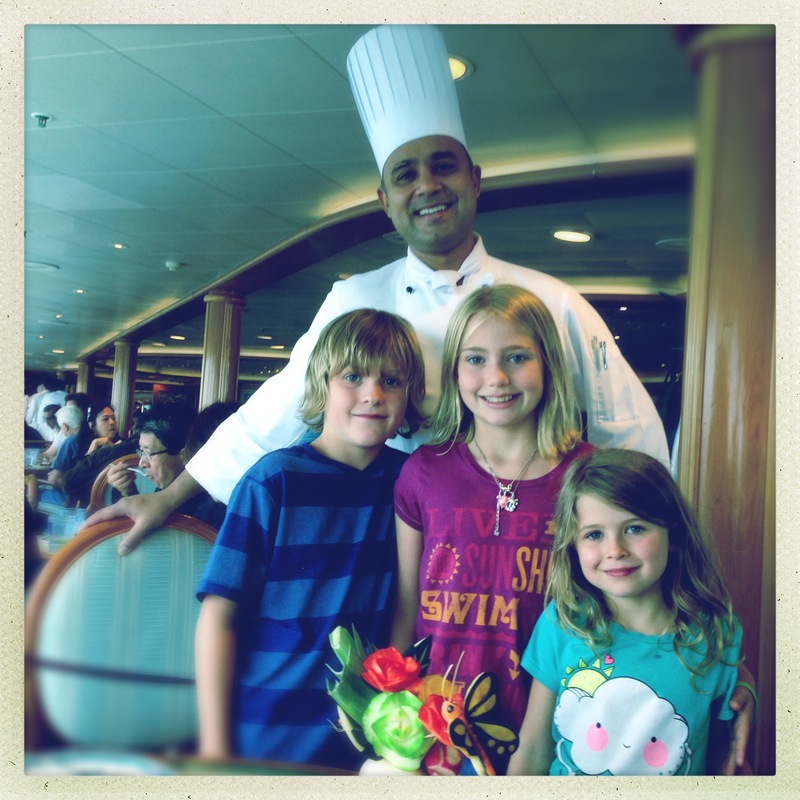 Freed from the restraints of parental oversight, Flynn, Willa and Maya had quickly made friends with C. S. Vasheesh from Ile Maurice, the head chef on the buffet line. Each morning, he would make them a special Belgian waffle to go with their sausages, pastries and rashers of bacon. Should they decide to lunch at the buffet, he would present them with special desserts. The name, “Vasheesh,” took on a mythic quality during our voyage, like some culinary Alexander the Great or George Washington. Between the staggering works of beauty of Vasheesh the Miraculous, the children had also discovered other avenues for dietary fulfillment — the pizzeria and hot dog grill by the pool, the ice cream stand, the afternoon cookies-and-milk cart on deck, the International Café, the chocolates left on the pillows in the evening by our stateroom steward Garry, and so on. 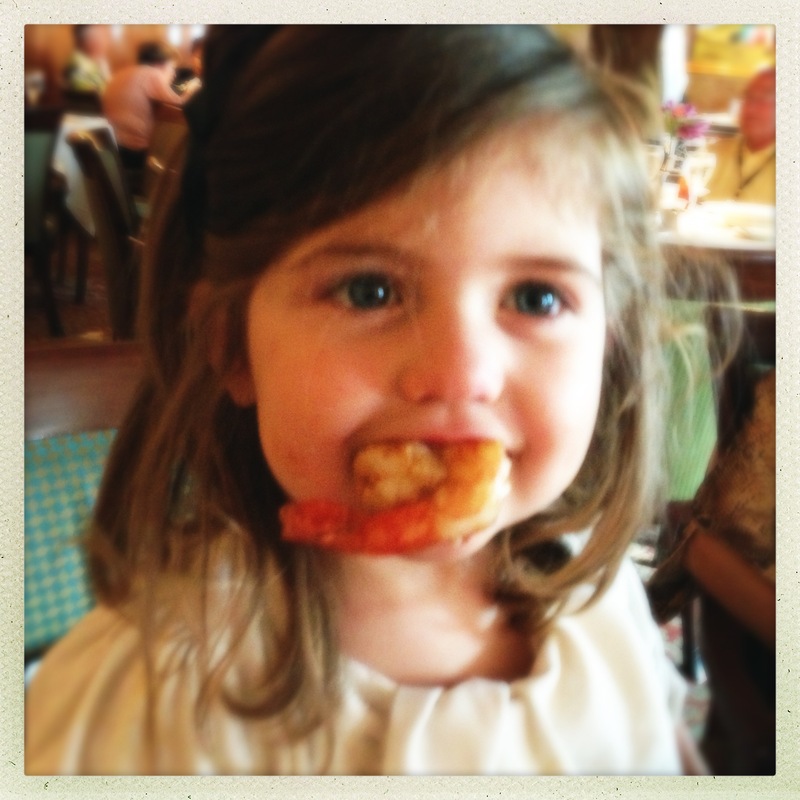 3-year-old Imogen was smitten with the smoked salmon, pizza slices on deck, and spaghetti with tomato sauce. And pretty much any dessert. And they had grown attached, as had we all, to our Botticelli Dining Room senior waiter/junior waiter duo of Agnieszka and Arsenije. She was the stoic Pole with a tender core once you got past her walls (mostly the childrens’ doing, not ours) and he the articulate, obsessive Serb who wanted to know all about the wines we had snuck onboard even though he didn’t drink and complained of his roommates leaving socks about and taught an infatuated Willa the finer points of end-of-meal crumb scraping. 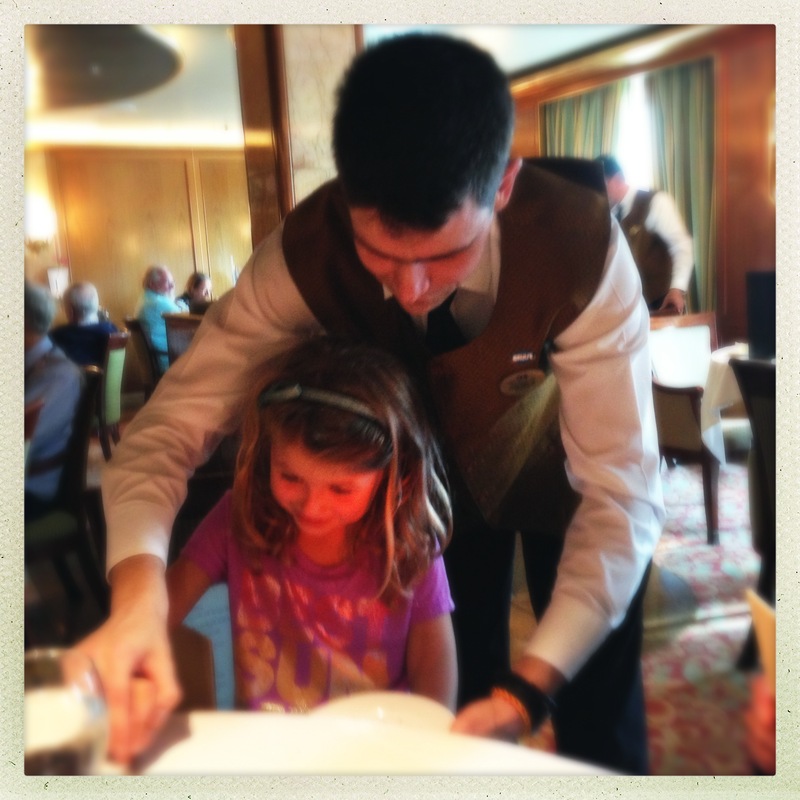 On the last night of the cruise, she leapt into his arms and he presented her with a shiny crumb scraper all her own. And we all hugged and exchanged information to keep in touch. An unexpected sense of community between you and the staff is one of the treasures of cruising left out of the wave-pool and zip-lining TV commercials. Princess is known for having superb pastas and outstanding freshly baked bread. While the dinner dishes in the dining room could be hit or miss, and the Taste of Alaska Buffet on deck was nothing short of disaster — the only representatives of the waters nearby being some tragically overcooked whole salmons — the carbs did stand out. Crispy light warm orbs of bread and sweet butter set a good note at the beginning of each dinner, and created ample displays of the requisite crumbs for Willa’s scraping after the main courses. Perfectly al dente pastas boasted interesting, fresh and creative sauces. After more than a week, as magical as the time had been, as much as we wanted to take Agnieszka and Arsenije home to Topanga to serve us forever, we were tired, bloated and ready to resume our normal lives. But for the children, 10 days onboard the Grand Princess had been pure bliss, a vision of all that life could be, the perfect vacation. I hoped the experience might motivate them to attend diligently to their studies and work hard to do well in life that they could sail through their adulthoods, too. The last night of the voyage, an exhausted Flynn sobbed in his bed. “What if I never see Vasheesh again?” I guess he, too, is now a cruiser. What sweet photos! I don’t think I’m a cruiser. Haven’t tried it. Not likely to. Though Steve has great stories of a QE2 voyage way back when. And you do make a rather compelling case for sitting on the balcony. It’s all about the balcony. You’d LOVE it! Wait, did Steve actually sail on the QE2!? I do a lot of writing for Cunard and spent an afternoon on the ship — man, was that a weird ship, Felt like you were in a Stanley Kubrick movie from the 60s. He did! From NYC to London way back when—I think in the 70s. WIth his crazy New Yorker dad. I don’t remember much about my QE2 cruise other than the enormity of the vessel, the odd crew at our dinner table (including a gruff, bearded, militaristic South African bachelor) winning 3rd prize in the ship’s spelling bee, and discovering huge North Atlantic swells can indeed make one queasy even on something the size of a battleship. “The Love Boat” has screwed up stateroom expectations for generations. What a wonderful and (as usual) beautifully written story.i was also sold on cruising when I snagged a student rate on the Italian Line from NY to Genoa for my post-college grand tour of Europe. Several years later I had an adventurous cruise on a Russian ship to Cuba in that brief moment when Jimmy Carter lifted travel restrictions. Your kids are so fortunate to have you and Leslie as parents introducing them to such explorations at an early age. Kind words, thank you Gregg! I’m envious of your Russian cruise to Cuba, you’ll have to tell me about that sometime! Any interesting stories you could share here? It was the MS Odessa that sailed out of New Orleans. We called it our “Commie Christmas Cruise” as it was during the holiday season arriving back in New Orleans for New Year’s. It was a smaller ship than the current ocean liners with about 500 passengers. The wait crew were mostly Ukrainian and wore heritage clothing as their uniforms. The crusine was Russian which was new for most of us but very good. Of course vodka. There were no hired entertainers on board so the staff would do folk dances or sing in the evening. Looking back it was very quaint compared to the luxury liners of today. One of the highlights in Havana was visiting Hemingway”s house that has been kept as a museum. Also all the 1950s American cars with their repair parts of coffee cans and such since they couldn’t get replacement parts. It was a great trip and before foreign tourism in Cuba took off. The people were very friendly and inquisitive as Americans had not been around for some twenty years at that time. That sounds like a fantastic memory, Gregg. Thanks for sharing that. My only cruise was on a freebie my parents foisted upon Lori and myself upon what we dubbed the “Greyhound of the Atlantic”. Cured of all desire to cruise thereafter but, after reading your stories and hearing your tales of cruising from our Campari tinged evening, I may be talked into once again, maybe . . .
Come sail away, Come sail away, Come sailllllll away with me!!! Ha! My husband never thought he was a cruiser either but after our first cruise we booked a second within 2 years. I always tell people that you never know until you try. I love being able to see 5 different places on one trip and I LOVE the days at sea. Being a girl from an island, there is nothing better to me than getting a chance to stare at the ocean for hours. Poolside. With a cocktail. Bliss! Sounds like you all had a great time! When I saw that shot on your blog of your feet up in the Caribbean with a fruity cocktail, I knew we were kindred spirits. You, too, are a cruiser! I love it! It’s nice to feel out a bunch of spots and find the places you’d like to return to. Before our cruise I would have said I wanted to stay a week in Jamaica. After spending a day in Ocho Rios, I discovered Jamaica is not for me. BUT I found I loved Grand Cayman and Key West. I just think it’s the perfect combo of adventure and relaxation. When you’re on the ship, you’re on the ship — you don’t have to worry you’re missing out on something or feel guilty about doing nothing all day. 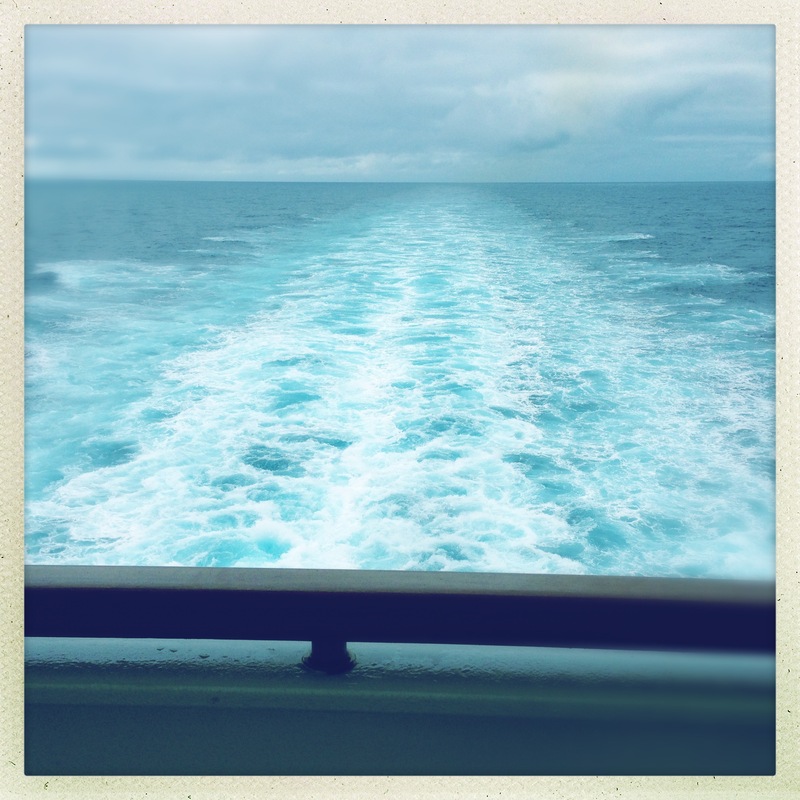 Ahh — I’m wishing I was cruising RIGHT NOW! It’s not for everyone though I think more people would like it if they tried it. Once you get through the cluster that is boarding, it’s pretty smooth in terms of crowds. We avoided the breakfast buffets usually and just ordered room service (which is free, I mean come on! why not?). I also loved cruising b/c my husband, being a chef, has crazy hours and eats at random times. He could stay up super late and still grab some pizza on the lido deck to snack on. Can’t beat that. Plus 2 for 1 bloody mary’s poolside? yes please! First thing Flynn said to me when I saw him on the first day back, at the mailbox, was how he got to know the chef du buffet! And the captain, but it was the chef who was the most important. I was wondering why your blog went dark. Glad that your back, and thanks for sharing. Probably one of my favorite blog posts to date. Welcome back!